Prince’s former home has hit the market. No, it’s not Paisley Park. 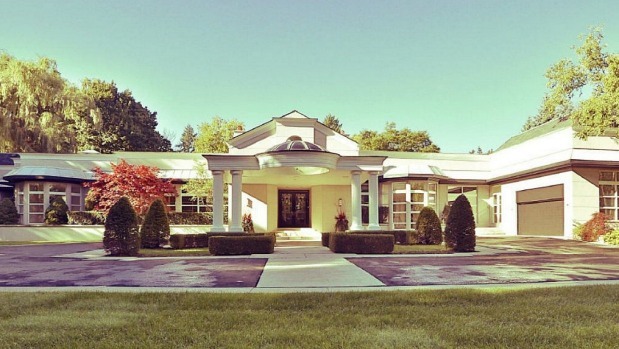 It’s the home in a celebrity-filled suburb of Toronto, Canada where Prince lived from 2001 to 2006, when he was married to his second wife, Manuela Testolini. The house is a bungalow-on-steriods sort of affair, and it’s full of reminders of the deceased artist, from the purple carpeting (of course) to his iconic symbol emblazoned on the dining room doors. The six-bedroom 10-bathroom home is situated on a two-acre lot in an exclusive gated community. The sprawling abode has more than 1300 square metres of living space. It’s listed for sale at NZ$17 million. The master suite itself is a seven-room extravaganza, with two dressing rooms, a massive bathroom, study and a ‘boudoir’. Prince and Testolini, the musician’s second wife, met when she was a consultant for his charity, Love 4 One Another. They married on Christmas Day in 2001 when she was 25 and he was 43. They divorced in 2007, and according to court documents from their divorce hearing, Testolini said they lived “an extravagant lifestyle” with a housekeeper and a personal chef preparing their dinners, the documents showed. Testolini said she “routinely had massages, spa treatments, manicures, pedicures and facials”, which explains the all-the-bells-and-whistles beauty salon located on the Toronto home’s lower level. Other amenities include a tennis court, swimming pool, fitness room, media room, games room and a heated outdoor cabana. When they divorced, Testolini was granted “a house in Toronto worth about US$6 million and a Lexus automobile”, according to a 2007 article in the Minneapolis Star-Tribune. She’s now married to Eric Benet, the ex-husband of Halle Berry.